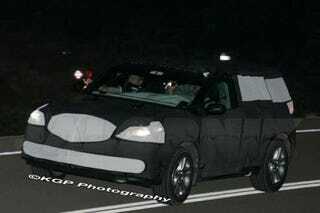 Engineers from Honda were spotted in the California night testing what appears to be a new Acura sport-crossover, not unlike the Infiniti FX35 and BMW X6. Despite extensive camo inside and out, the low-slung crossover had wheels and tires more appropriate for handling than off-roading, and upscale cues that tend to signal this is an Acura model rather than a new Honda. That SRX-like rear is likely fake, with the actual vehicle having a heavily sloped rear silhouette. Full spy report after the jump. We caught engineers from Honda or Acura night-testing a brand new prototype for what appears to be a sport-crossover model aimed at the likes of the Infiniti FX35 and BMW's X6. The new prototype was tested under cover of darkness in the California desert to thwart spy photographers, but we managed to get a series of revealing shots of the fairly low-slung crossover—as engineers fired back at us with lights of their own. Through the camouflage, the prototype appears to show some styling cues that appear more upscale Acura than Honda—especially the chunky exhaust tips molded into the rear bumper. The windshield is steeply raked, and the roofline appears to slope downward in the manner of today's "four-door coupes." The camouflage goes to some lengths to try to hide the roof's true shape, but the squared-off backlight is certainly a fake, and there also appears to be ample camouflage inside the rear seat area to further obscure the prototype's sihouette. The headlights glowing through the front camouflage appear to be very angular and slit-like, mimicking the face of the latest Acura models. The prototype's dimensions look quite tidy, which should bode well for the new crossover's efficiency, as well as its sport-minded driving dynamics. The aggressive wheel-and-tire package on this test vehicle looks more appropriate for canyon carving than for off-road pursuits. The timing of this model is unknown, but Acura TL prototypes that were first night-tested this time last year are just now going public. If that schedule holds true for this model, BMW and Infiniti might have another competitor in the performance utility sector on the horizon in about 12 months.